Several pools throughout the resort are great for kids and grown ups. Kids will love making new friends during a game of volleyball and more. Spacious condo residences give you space to enjoy some quiet family time. Shaded by trees, the lakeside grills and picnic tables are great for a family cookout. Get free shuttle service to Disney, Universal, and SeaWorld. Westgate Leisure Resort is away from the crowds but just a quick shuttle ride to Orlando’s best theme parks. After getting settled into your condo, change into swimsuits, grab pool toys and water wings and slather everyone with SPF. There are two outdoor heated pools – try them both and pick your favorite. Little ones will love the kid's splash pad. Thinking burgers for lunch? If the weather is cooperating, take advantage of the gas and charcoal grills and have a family cookout. Recruit the kids to help carry side-dishes and condiments. While the kids are hanging out in the game room get in a workout at the fitness center then meet up later for a game of sand volleyball or mini golf. One- to two-bedroom condos sleep four to six guests. Full kitchens because sometimes a mini-fridge just doesn’t cut it. The kids will be begging to help make your famous chocolate-chip cookies (and be the official taste testers). And freezers are perfect for storing dessert – popsicles for the kids (and a Häagen-Dazs stash for the grown-ups). Don’t worry when the kids inevitably end up with chocolate on their clothes; that’s what the in-suite washer/dryer is for. Up for a low-key night in? Flatscreen TVs with premium channels have you covered. Gather everyone on the couch, put one of the kids in charge of the remote and another on snack duty and get ready to be entertained. Be sure to pack some of your favorite movies from home, DVD players are perfect for family movie night. Westgate Leisure Resort offers a free shuttle to major theme parks – score! SeaWorld® offers rides, shows and animal experiences. Test out your bravery on Mako, it’s Orlando’s tallest, fastest and longest rollercoaster. Fly like a manta ray on Manta or ride Kraken Unleashes, a floorless virtual reality rollercoaster. See Clyde and Seamore in Sea Lions Tonite, orca whales in Ocean Discovery or dolphins in Dolphin Days. Animal experiences include the five species of penguin at Antarctica: Empire of the Penguin (Habitat) and the Dolphin Up-Close Tour. Universal Orlando® consists of two theme parks: Universal Studios® and Universal’s Islands of Adventure®. Dinosaur lovers will want to go on the Jurassic Park River Adventure®; little ones will love A Day in the Park with Barney and the Dr. Seuss Rides. Harry Potter fans will want to purchase a park-to-park ticket so that they can fully experience everything that The Wizarding World of Harry Potter® has to offer. Escape from Gringotts, fly with a Hippogriff, ride the Hogwarts Express and try butterbeer. Check out The Tales of Beedle the Bard, it’s a trunk show performed by The Wizarding Academy of Dramatic Arts. Visit Walt Disney World® to experience a different kind of magic. Experience the food and culture of eleven different countries in The World Showcase® at Epcot®. Ride classic attractions Pirates of the Caribbean®, Dumbo the Flying Elephant® and Haunted Mansion® in Magic Kingdom®. See Beauty & the Beast Live On Stage and For the First Time in Forever: A Frozen Sing-Along in Hollywood Studios®. Fans of Avatar will want to see Pandora - The World of Avatar® in Animal Kingdom®. The front desk is open daily 7:00 AM - 11:00 PM. Guests planning to arrive after hours must contact the property at least 24 hours prior to arrival to receive late check-in instructions. Guests can receive detailed instructions by contacting the office using the number on the reservation confirmation received after booking. Parcel deliveries, handling, and storage will be subject to a fee starting February 1, 2015. For more details, please contact the office using the information on the reservation confirmation received after booking. Natural choice if you're combining business with a vacation. 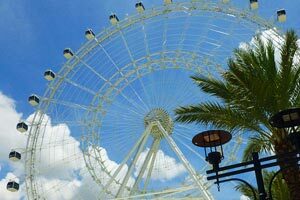 Tip: Ride the Orlando Eye, the fifth tallest ferris wheel in the world. Distance: 13 miles to airport. 5 miles to Disney.